Impress your friends and family by using this American Flag tableware set for your next 4th of July celebration, whether you are having a small picnic or throwing a huge BBQ for the entire neighborhood. You can choose from an entire Decorating Kit, Lunch Napkins, Dinner Plates, Dessert Plates, a Table cover and Cups. Each piece of the tableware set is printed with a graphic of the American Flag as if it is blowing in the wind. This American Flag tableware set is sure to match all of your decorations with its red, white and blue stars and stripes so don't miss out on this great opportunity! And of course we always love hearing from our very loyal customers! If you have any questions or ideas for new products feel free to give us a call or leave us a message! We’d be happy to hear from you! And who knows? You might just see your idea on our website in the near future! 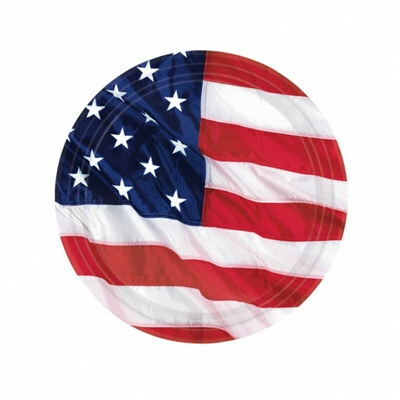 No matter what kind of American Flag Tableware and other party supplies you’re looking for we’ve got you covered! We’re PartyCheap.com and we know how to party! For the Fourth of July, nothing is more patriotic than watching some fireworks while eating burgers fresh off the grill. For your cookout, you will need to be equipped with some truly American tableware. These cups, plates, and napkins feature the famous Stars and Stripes right on the front. If you're having a house party, decorate your home! Check out our Fourth of July Decorations to make your home patriotic. Our Fourth of July tableware is just as patriotic as the holiday itself. An image of the American flag gracefully blowing in the wind is featured on all pieces of tableware. For drinks, we have these American Flag Cups. They hold 9 ounces of either hot or cold beverages. For your food, try these American Flag Plates. Each paper plate measures 7 inches in diameter, the perfect size to hold a piece of cake or delicious apple pie! 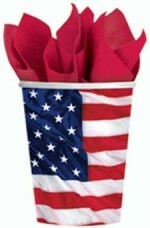 Finally, to clean up, use these American Flag Lunch Napkins, which measure in at 12 and 7/8 inches. Make this Fourth of July party a hit with the help of our patriotic tableware! No matter what kind of red, white and blue decorations you're looking for we've got you covered. We're PartyCheap.com and we know how to party!